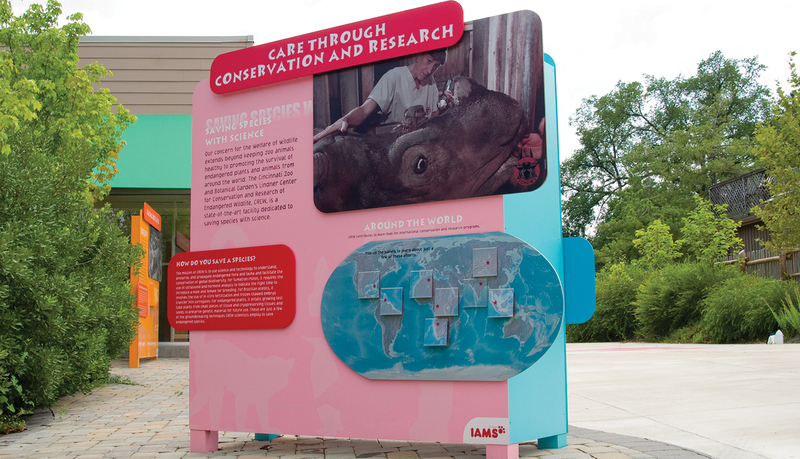 Cincinnati Zoo & Botanical Garden’s Iams Animal Wellness Plaza links the new state-of-the-art W. Rowell Chase Animal Hospital with the Carl H. Lindner Jr. Family Center for Conservation and Research of Endangered Wildlife (CREW). 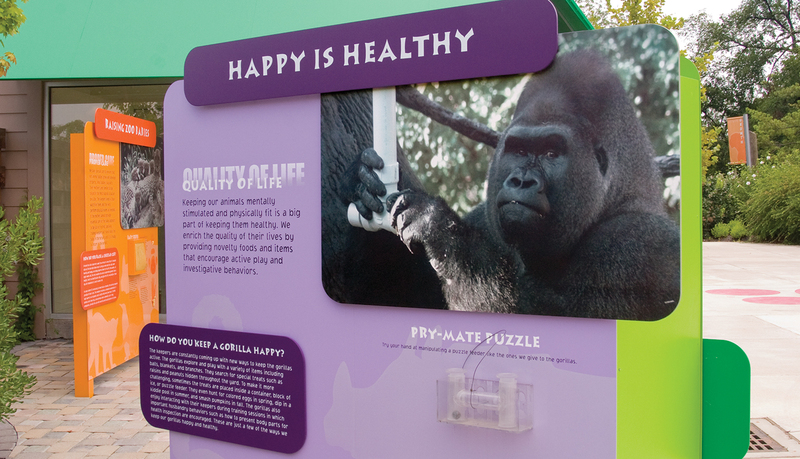 The plaza is a gathering place for zoo visitors and features exhibits celebrating the important relationship between animal health, nutrition and the science conducted at the zoo. 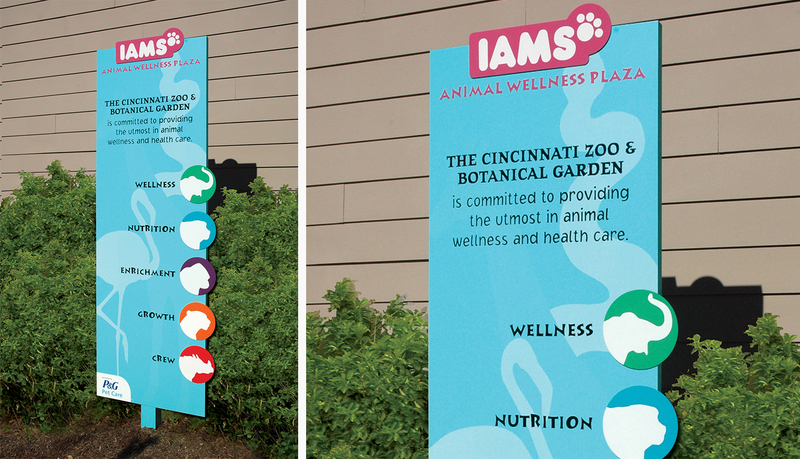 The Cincinnati Zoo & Botanical Garden needed a signage system to educate and inform visitors to the Iams Animal Wellness Plaza about animal physiology and health. 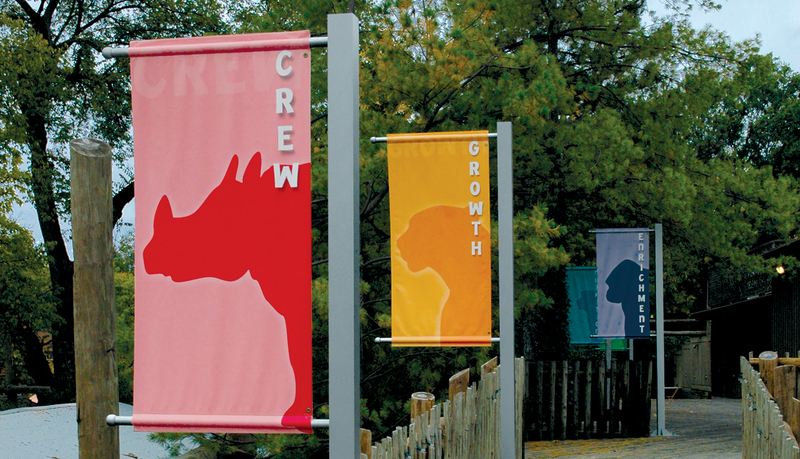 The zoo wanted the signage to be vibrant and fun for everyone – regardless of age. 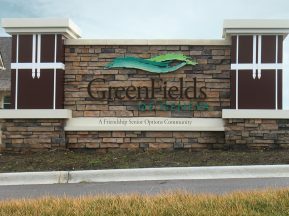 Because the signage would be located outdoors and in a high traffic area, the solution needed to be durable. 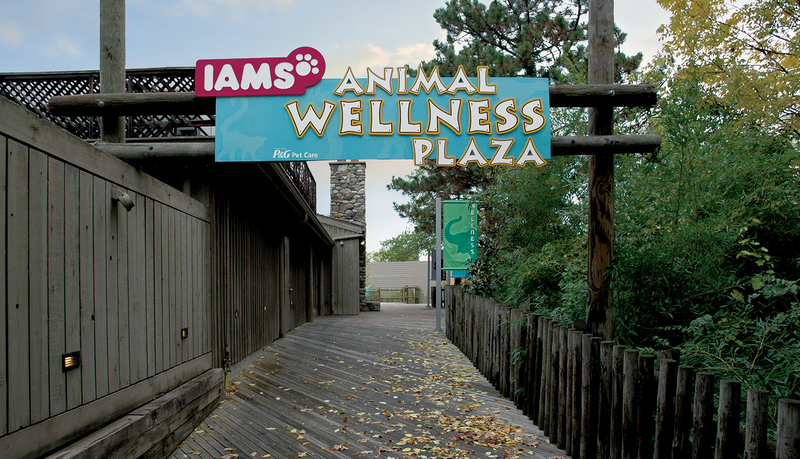 Additionally, a wayfinding post & banner solution needed to be designed to be attached to the vaulted deck that leads people from the main zoo into the Iams Animal Wellness Plaza. 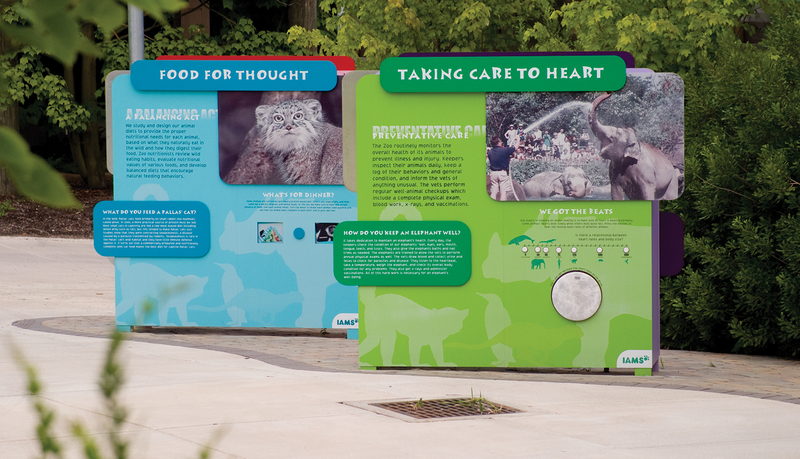 ASI worked with the Cincinnati Zoo on two previous projects, including the interior signage and exterior dimensional lettering of the W. Rowell Chase Animal Hospital. 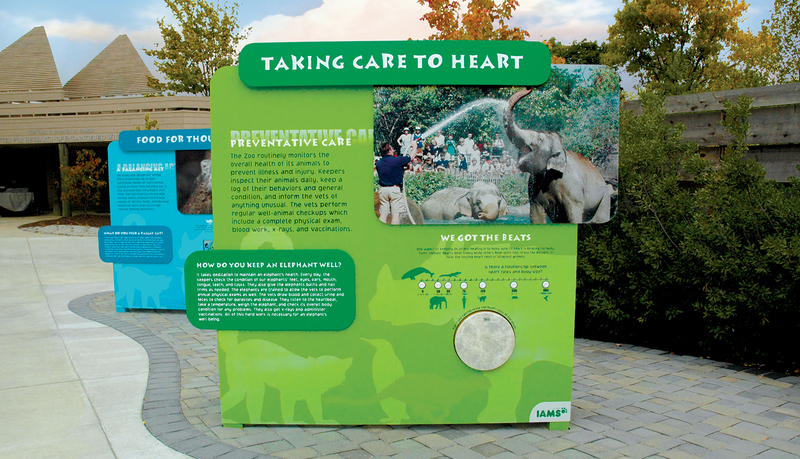 When made aware of the Iams Animal Wellness Plaza project, ASI began to offer options that would satisfy the needs of the zoo, offer an innovative solution and meet the zoo’s budget. 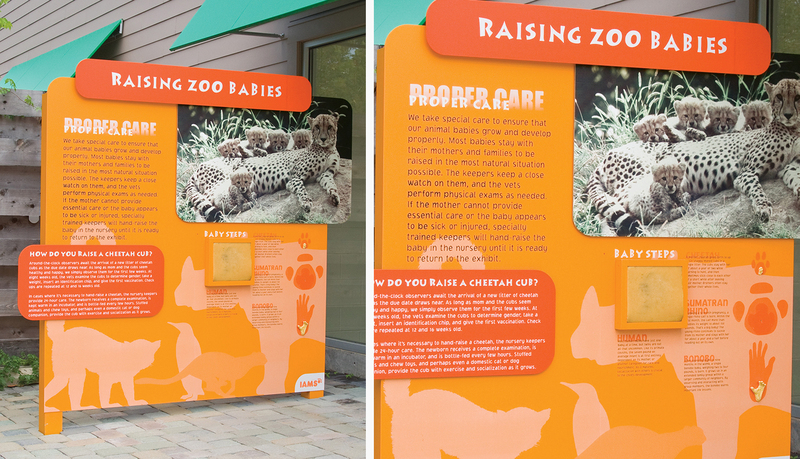 ASI introduced the zoo to a kiosk solution with the ability to display crisp photography and vibrant colors. 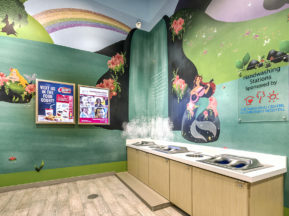 The kiosks are extremely durable and able to withstand the outside elements and the high-traffic environment – not to mention excited, curious children. 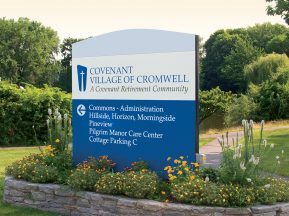 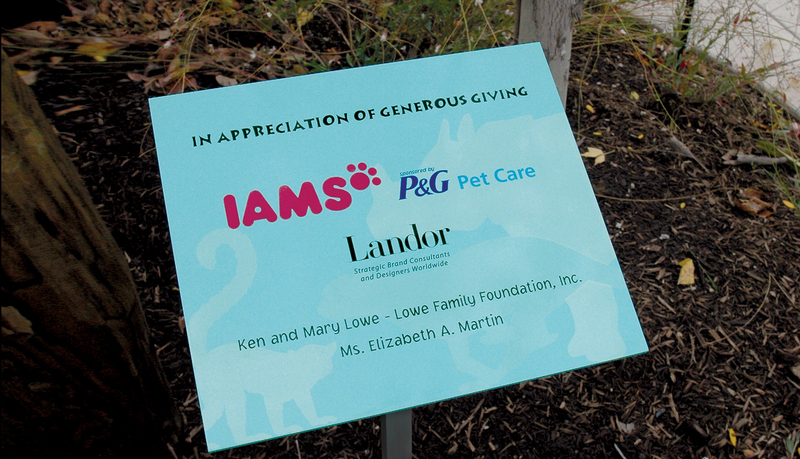 In addition to the kiosks, ASI provided the custom main ID to the area, the garden stand and donor plaque, and the custom posts for the vibrantly colored banners that lead visitors to the Iams Wellness Plaza. 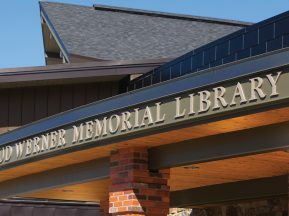 The posts required specially designed brackets that mounted them to the vaulted deck.